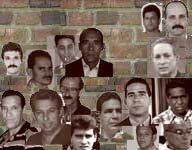 The Castro dictatorship is no better than a mafia family, but they couldn't make political prisoner Antonio Díaz Sánchez he couldn't refuse. And he is now paying a heavy price. CubaEncuentro.com is reporting that Díaz, imprisoned since the "black spring" of 2003 and in a prison hospital for the past 8 months, was transferred to a punishment cell after he refused an offer from his captors: If he agreed to wear a prison uniform - prisoners of conscience make a habit of refusing the garb - he would be transferred to a prison near his residence in Havana. Díaz refused the blackmail, and was instead transferred to a prison in Ciego de Avila, about 500 kilometers from his residence. His cell is little more than a cage, complete with poor lighting, damp conditions, a concrete slab for a bed and a hole in the ground for a toilet. "This confinement in inhumane conditions, which endangers his health and cause permanent pain and discomfort, is a physical and psychological torture they are using to torture our brother who is only defending his dignity," said Oswaldo Payá Sardiñas, head of the Christian Liberation Movement, of which Díaz is a member. The world, especially the Obama administration, needs to remember men like Díaz before it becomes enamored with the idea of talking with the cowards that run the Castro dictatorship.